At a time of uncertainty, fear and suffering in our world holding onto Hope is so very important. At Habitat we choose to put God’s love into action by bringing people of all backgrounds together to build homes, communities and hope. We see hope grow as families begin to build their lives on the solid foundation of a simple home. 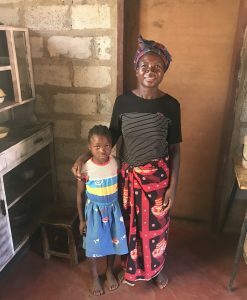 Earlier this year I had the joy to visit Zambia and saw how hope had grown for 20 families who now lived in the 20 homes which have been completed with the support of people across Ireland. Dailess and her daughter Prudence live in the Kamanga community in Zambia. Dailess has been living in a crumbling home where she and her daughter were forced to sleep standing up when it rained. They feared that their home could not withstand the rainy season. Dailess was happy to welcome us to her new home which is full of hope for the future. I left Zambia hopeful that we can inspire more support for this work, hopeful that people across Ireland would choose hope this Christmas. We can build a Habitat home in Zambia for €3,500. Homes that mean the whole world for the families who wait and hope. This Christmas we are asking people to choose hope and donate €35, every 100 donations means we can build another home, which will deliver the gift of hope so that children will have the safety and security they deserve. Thank you so much for all that you have already done to support our work. May this Christmas fill you with a fresh sense of hope and if you are able please give whatever you can afford so that hope continues to grow in the lives of those who wait in Zambia. P.S. This year, we are grateful that the Hilti Foundation will be matching each donation made to our Christmas appeal. This means that more than ever, whatever you can afford will make a huge difference. Donate now.